Isn't this a gorgeous quilt? We love the strong border and diamond block patterns and we can't wait to see how ours will turn out! This is an older project so the collection they feature is most likely unavailable, but there are similar fabrics out there, so if you are wanting a quilt that looks like this you can do it! 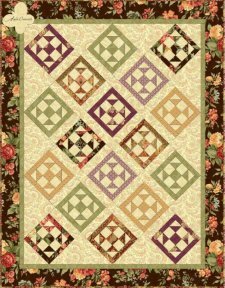 This quilt was inspired by the fabric stash collection of Marie's mother. This project is brought to us by Quilting Treasures and Fons & Porter. Enjoy!